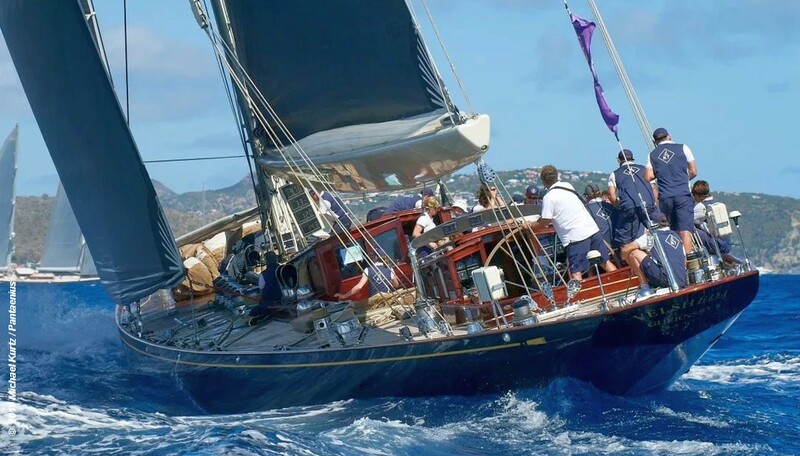 The first racing day at the 31st edition of the St. Barths Bucket saw 34 magnificent superyachts in six classes on a counter-clockwise course around the island of Saint-Barthélemy. It was “high fives all around” for the 33.3m ketch Blue Too, which handily won the six-boat Les Femmes class in the 5-18 knot breezes that blew steadily throughout its race of nearly 22 miles. The 33.3m sloop Nakupenda, which finished second across the line, took a penalty for failing to observe a mark and fell to fourth, allowing the 43.1m Vitters-built Bella Ragazza a second-place finish. Aquarius, a 56.2m Royal Huisman ketch, outpaced all five of the other Les Elegantes class competitors, crossing the finish line ahead of its closest competitor, the 39.3m J Class sloop Velsheda, by just under three minutes. Other classes were topped by the 59.9m ketch Hetairos (Les Gazelles), the 35m ketch Sojana (Les Mademoiselles), the 58.7m Perini Navi sloop Perseus 3 (Grand Dames) and the 49.6m sloop Ohana (Les Voiles Blanche).